Piestewa Peak... One of the greatest sources of entertainment in Phoenix. There are so many elements of humankind that come together to make a visit to Piestewa such a unique and enjoyable experience. For me, the entertainment begins in the parking lot, before I even step out of my truck. Most people drive here with the goal of climbing a 1,200 foot mountain with an average grade of 22%. We're talking steep, rocky, and rough. They hike this mountain knowing they'll return to their vehicles with red faces, soaked shirts and burning muscles. It's a place to push your body to it's limits and test your endurance. It gives the boring desk job slugs (like myself) a chance to exercise their legs and keep a healthy metabolism. Everybody here is either maintaining their hard bodies or attempting to trim them through the hard, vigorous walk this mountain provides. BUT.... There is an amazing phenomenon that occurs in the parking lot, before people step foot on the ground to begin their leg-burning hike. Prior to ever hiking Piestewa, I had only experienced this phenomenon at grocery store parking lots on crowded Saturday afternoons. It's called parking spot vulturing. If you are not familiar with this term, I'll exemplify it here: It's 1:00 PM on a Saturday and you're weaving through Safeway's parking lot to find a space to park that's not a mile away. Suddenly you come to a complete stop behind an idle car in the middle of one of the rows. Confused, you glance around. Why is this car idling? There is no open parking spot. Their hazards are not on. They aren't talking to a pedestrian. Then you spot it... A family with a shopping cart heaped with bags of groceries is approaching a car which is parked near your idling friend. They walk pass that car and continue to the next... Your idling friend who's blocking you from driving any farther eases their foot off the brakes and inches forward behind the family, waiting patiently to snag the precious parking spot... Finally the family reaches their car and starts to unload groceries, the car in front of you engages their parking brake, and you're in for a five minute wait if you want to continue down that isle. As you throw your car in reverse, you clearly mouth some choice words about how lazy and inconsiderate that person is and then back out of the isle and drive on your merry way to a spot out in the middle of BFE. This is a classic case of parking spot vulturing. If you, like myself, don't mind a few extra yards added to your workout, then this hike is for you. In fact, chances are you've seen the sign for this trail and ignored it. I always thought it was a trail to an actual alternate summit (hance the name), which excited me. It's not, but it's still kind of exciting for other reasons. Park in the very first parking lot on the right side of the road once you near the preserves. This lot almost always has a couple spots. From your car, immediately cross the road and you will run right into the sign: Alternate Summit Trail. Head left on the trail towards the houses and away from the park. If I remember correctly, the views into backyards were pretty good, which is something to note if you're into that sort of thing. The trail stays flat and starts to curve around the base of the small peak to your right. It turns into a faint jeep trail here. Wait... A faint, yet marked trail out of the Piestewa Peak parking lot? Yes. Soon it becomes more defined again as you loop back towards the park. A canyon appears in front of you. As the canyon closes in, you start to gain elevation, and the top of Piestewa Peak is in perfect view up ahead. It's still very far away, don't get excited. From here, the trail stays on the right side of the canyon, gaining elevation rather quickly without switchbacks. The desert scrub on the uphill (right) side of the trail is a bit overgrown, so be careful what brushes up against your leg. It could be rather painful. Before you know it, you are peaking over the saddle ahead of you onto the summit trail, and then suddenly you're there. Be on the lookout for confused looks as the masses notice your head pop up from down there. "There's a trail there?" they'll ask. No... I was just doing some illegal exploring. That will keep them away. Actually, there is a pole sticking out of the ground near the junction of the Summit and Alternate Summit trails, but it's out of view from the Summit trail side, so people don't bother noticing it. 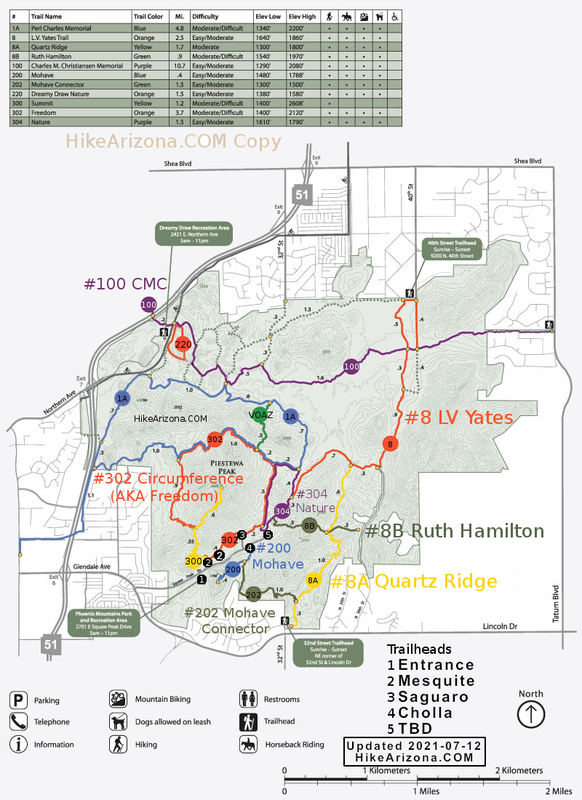 The two trails join near the very first saddle at the bottom of Piestewa Peak, so if you are planning to hike to the summit, you are able to skip over the first 4 switchbacks of the Summit Trail. This is nice because those are usually the most frustrating switchbacks as far as person volume goes. Several people on the Summit Trail will hike up to that saddle and turn around, so the switchbacks tend to be very crowded. This is also the section where you encounter the most wild goose downhill sprinting The Alternate Summit trail also makes a decent little .75 mile loop with the Summit Trail for those with little kids. And then, of course, if you're the type who likes to have the primo spot near the trail, but somehow you just couldn't pull it off today and had to park in that first parking lot, this trail will fool you into thinking you got a good spot next to the trailhead. And that's all that matters, right? Between 16th and 24th Streets on Lincoln Drive go North on Piestewa Peak Park. 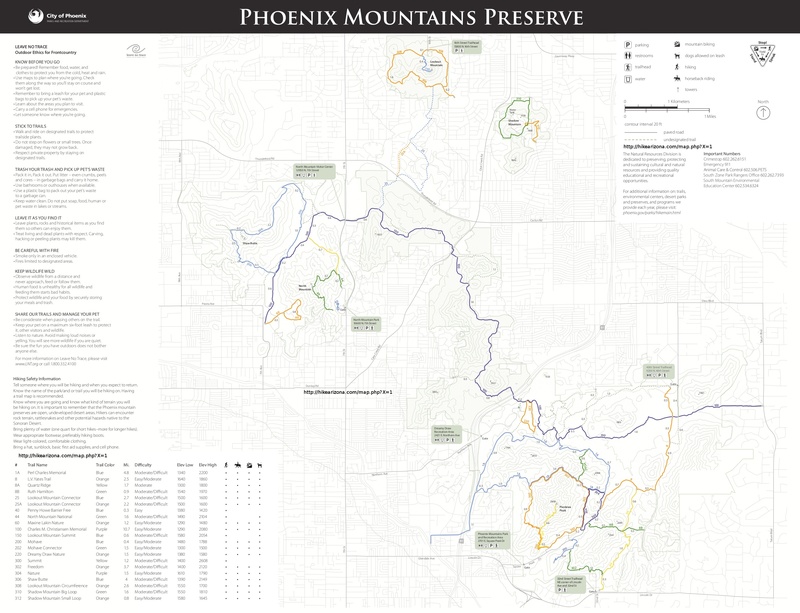 Follow Piestewa Peak Park through the neighborhood into the park. Park in the first lot on the right.